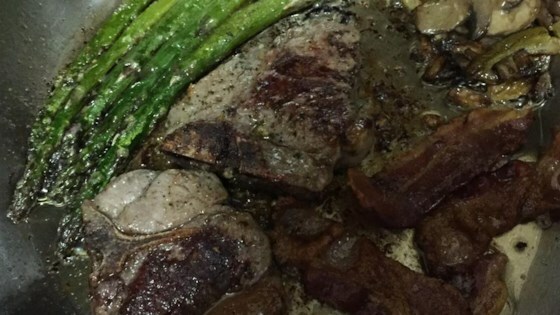 "Lamb chops topped with cracked peppered bacon and sauteed mushrooms. Simple and very filling. Good served with grilled red peppers and green onions." See how to make grilled lamb shoulder chops with homemade mint jelly. This was fantastic! The only change I made was adding a large onion (sliced) - I sauteed it along with the mushrooms. This was a good combination of flavors but I felt it was missing something, not sure what though. Served it with steamed asparagus, and buttered baby potatoes. Thanks! Very nice recipe. I had to substitute pork chops for the lamb as unfortunately, my husband won't touch lamb. Turned out well.